A great gain for the Wellington meditation community, Stephen Archer has recently moved here with his partner Annie Chapman. 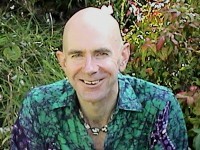 They were previously involved in the running of a retreat centre up in the Coromandel, and Stephen is now involved with the Original Nature Mediation Group. Stephen has a long history with meditation – he first ordained as a monk back in the early eighties. He now brings this depth of knowledge and understanding to retreats all over the country. 1. What style of meditation do you practice and where do you teach? I practice Insight meditation in the Buddhist tradition, which involves responding to the great demand of conscious life and working to honour my heart through all the conditions of existence. I work as a meditation teacher and mindfulness trainer in Wellington, and lead residential retreats nationwide. 2. How did you come to meditation? A very strong instinct has drawn me to spiritual practice since the age of 14. At 22 I ordained as a Buddhist monk and learnt meditation from my teacher Ajahn Sumedho. Currently my spiritual life is catalyzed by my relationship with Sri Yanchi-ji. 3. When did the meditation bug really get you? When I did my first week-long meditation retreat at the age of 22. I have never recovered from the experience! 4. How has meditation transformed your life? Meditation has helped me relax enough to be more connected with what I intuit to be most real. I have discovered that natural environments greatly assist me to feel mindfully aware, along with developing loving relationships. I value time to meditate alone and also within community. 6. When people ask you, “What is Meditation?” what do you say? The practice of recognizing who and where we really are, and animating this radical awareness. I like to offer people both a cognitive and heartful explanation of what meditation is, along with a period of guided meditation and time for questions. 8. What do you love most about teaching meditation? It’s truly new every time. It is both thrilling and deeply satisfying to be alongside people as they open to the deep of their being. 9. What do you wish everybody knew about meditation? That the body/mind itself contains the natural resources for well-being. 10. What role do you see meditation playing in our world? It can assist us to respond to the spirit of this world by cleansing our vision, so we see things as they really are – in their sacred context. 11. Where can people find you? I have a private practice and see clients one-on-one, and also run workshops and retreats. If you want to connect with me or be put on my database please contact me on stephenarcher@wellness-solutions.co.nz, 0r call me on 0274 356352.